• Blend two different colour to a wig. • Add colour streaks to a wigs. • Add different textures to a wig. • You need to lengthen a wig. Classe Wig in Japan as a few post showing great examples of Stacking and splicing wigs for colour's. 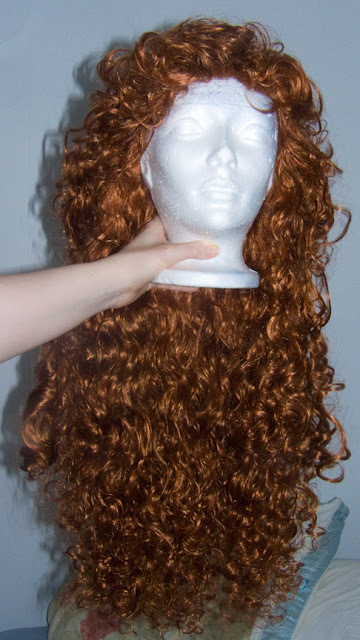 A true stacking is literally taking one wigs and sewing it under another one. Here's how I did Merida. I started with two wigs in FireRed shade from Newlook brand. The Cathy XL and the Mary G-1000. 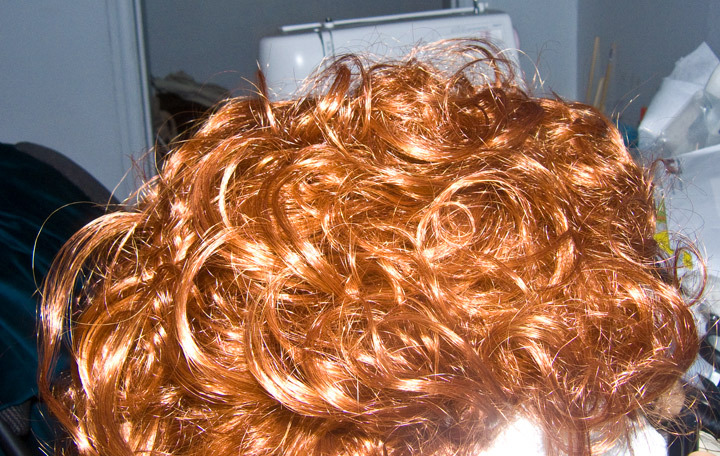 These two wigs are mostly curly but have different texture to them. 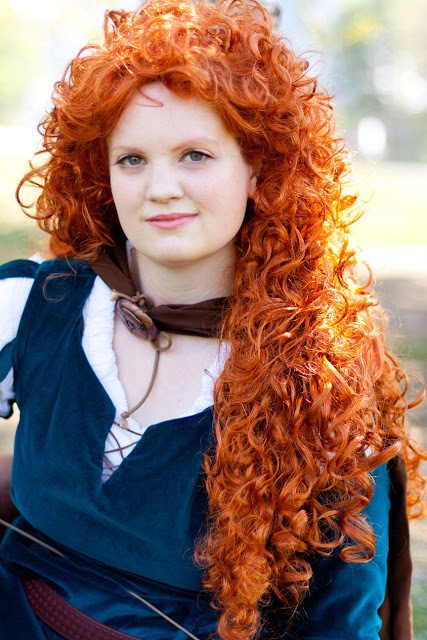 Merida's hair has layer of different texture as well as thickness. 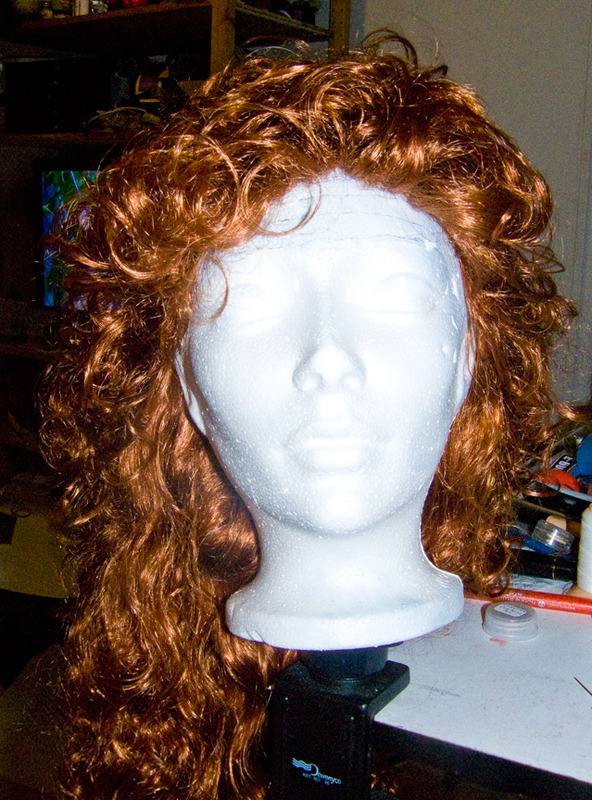 In my case I used the Cathy XL wig as my top wig layer. Out of the two styles once I got them in the mail the Cathy XL look like a better Fit then the Mary G.
Newlook now has a PP-Brave Brave Princess wig as an option That i probably would have chosen as my top wig if I it was an option at the time. These two wig have me length volume and texture when combined. Step 1: Pin your wigs down. 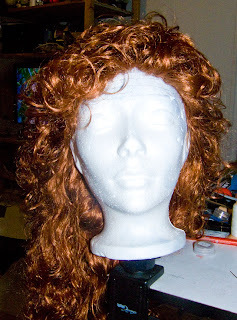 I used a foam head to pin the Cathy XL and then the Mary G over in and place them inside out on the wig block. I'm my case I off set the Mary G bu 2" from the hair line to ad a bit more length to my wig. 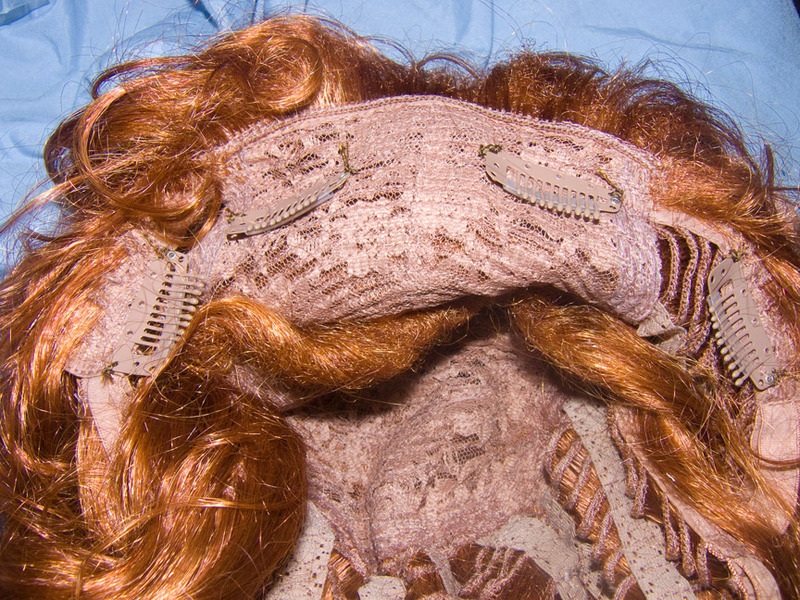 Pinning helps you to sew as well as you not fighting to keep the wig in the position as you sew. 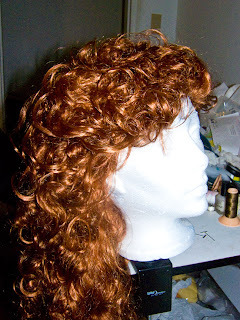 Step 2: Tack sew you wigs together. In this case you only needed to tack sew the from hair line of the Mary G to the Cathy XL crown to keep the wig in place. If you're aligning two wigs directly on top of one another you want to only sew the crown mesh area and the nape of the neck of the wig are these tow stop are always the same shape when wearing a wig. 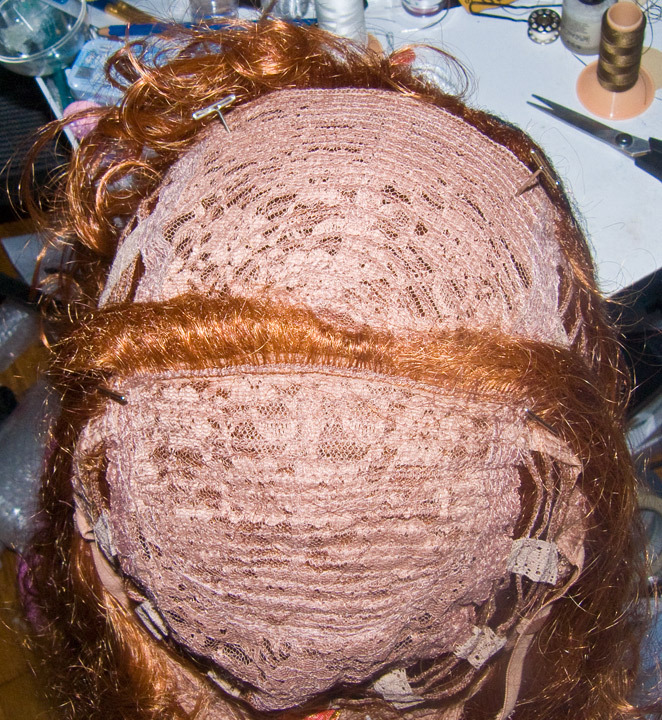 The rest of the wig is designed to Expand as that area is made with elastic bands and you don't want to lock the elastic in place buy sewing trough it. Step 3: Check you stitches. Simple enough, before you do any styling just make sure you thread is not showing through the hair. 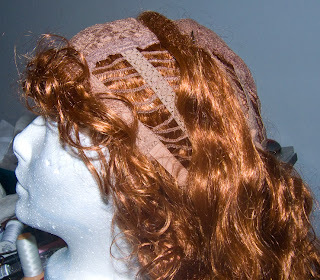 Step 4: Sew in combs or Toupee Clips. Technically this is optional but since you are doubling the weight of your wig it not going to stay in place with bobby pins. I've been using Toupee Clips for 4 years now on all my wigs as the secure the front hair line of my wig to my hair own hair. I sew the Toupee Clips about a full 1.5" to 2" from the hair line of my wig that way the secure the teeth of the combs into a thicker section of hair in my crown area. With this method my wig will not budge for a full 16 hour day unless I take it out myself. 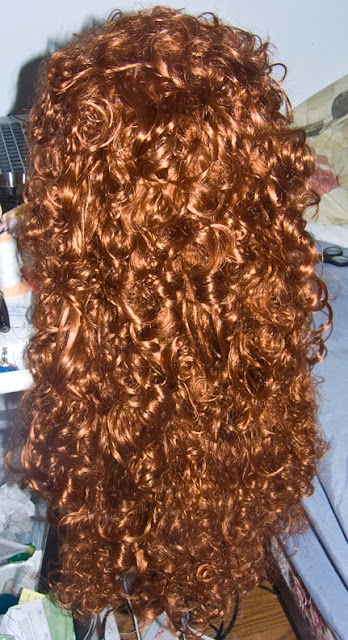 You can blend a wig a few different ways. For Merida I got away with just weaving the hair in and out the lower section by hand. The curls kept them in place. Another option is to pull the hair through the rows of wefts (Wefts are the rows of hair you see sew into the wig). there is a gap between each row of weft that if you have the time you can grab a curls at a time and pull through with your fingers. Finally this is the texture I got. Wearing this wig that didn't have the nape tack stitched down was interesting. The front hair line was clip-on first then I had to fit the bottom wig over my hair, then fitted the top wig over my hair so that booth layer were flat to my head shape. You can see more photo's of my wig (and costume) here.